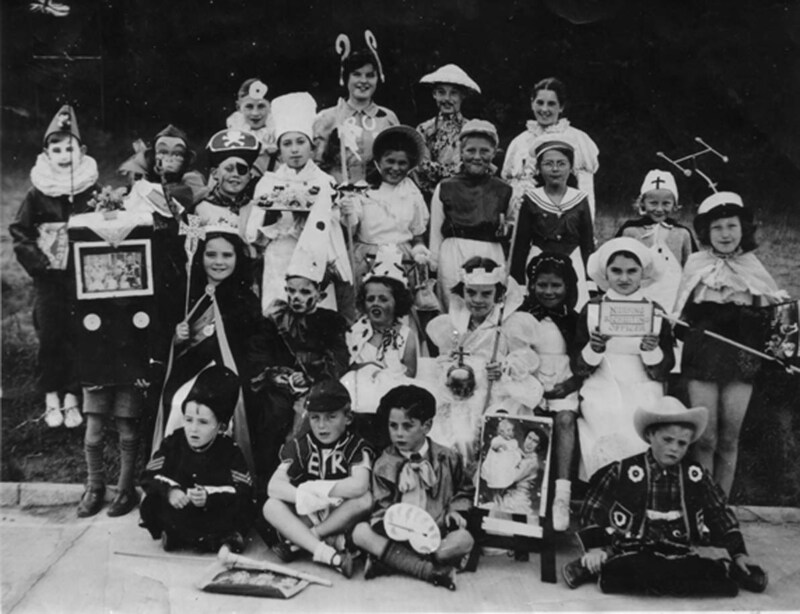 Alan Pennington has kindly sent this wonderful photograph of a fancy dress competition at Ysgol Llywelyn. It was taken 60 years ago, in 1953, to mark the Queen’s Coronation. Alan is the clown holding the book, which he says “was a special prize given by Prince Cox himself who judged the entries. It was he who put on the circuses at the Pavilion of blessed memory”. 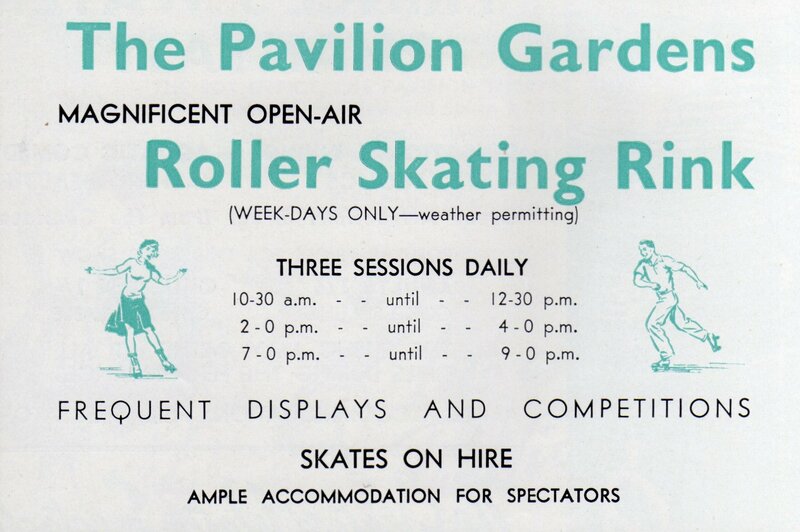 Your holiday in Rhyl, 1955. 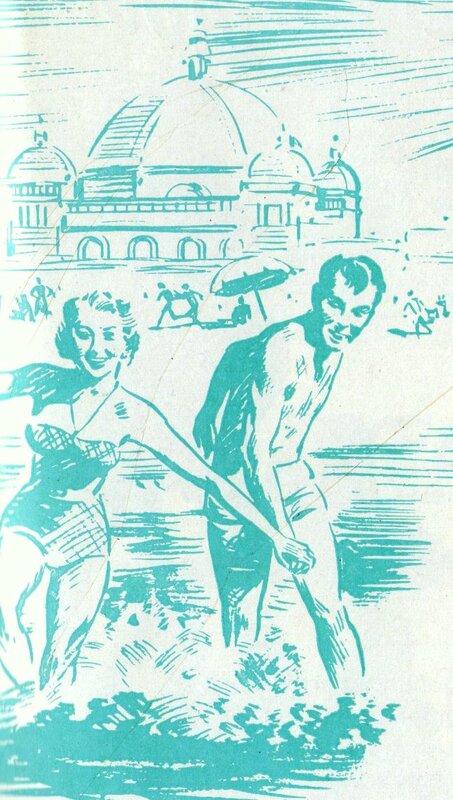 The creators of the Rhyl Tourist Guide for 1955 came up with the great idea of featuring a real family in their brochure, describing how they spent their holiday in Rhyl. Apparently many people applied to be the “Ideal Family” featured in the brochure but a Liverpool family was selected and was featured, complete with photographs. “Dublin born John Reilly* (40), more than 6 ft. tall, a stonemason. He has worked in cathedrals all over the country. He was a “Redcap” during the war. Molly Reilly, born in North Wales thirty four years ago. Blonde and smiling, worked in an income tax office. Maureen (11), tall and healthy, with the Grammar School Entrance examination very much in her life at the moment. Michael (7), the imp of the family, full of fun and a real “lad”. Geraldine (5), with her pretty face and fair hair she makes friends wherever she goes. A typical happy British family, so let’s see how they spent a holiday in Rhyl. A stroll along the promenade is the usual order after settling in. This particular Saturday was not a bright day so Father decided the family on the Pavilion Circus. What a splendid show for the kiddies. Clowns, acrobats, animal acts, jugglers, in fact everything we expect in a good circus show. Afterwards the Clowns and the Circusettes thrilled the kiddies by coming round to meet them personally. Back to the hotel for a really good meal at five o’clock and then a pleasant stroll in the setting sun, then with sandwiches and milk for the kiddies, tea for Mother and away to comfortable beds. Sunday was a glorious day and soon after a good breakfast the family made for the beach. The sea was lovely and warm, and so inviting that both Mother and Dad had to join in with the kiddies in a paddle. Everyone’s so friendly at Rhyl, little Geraldine soon found a pal to help in searching out the treasure in the sands. 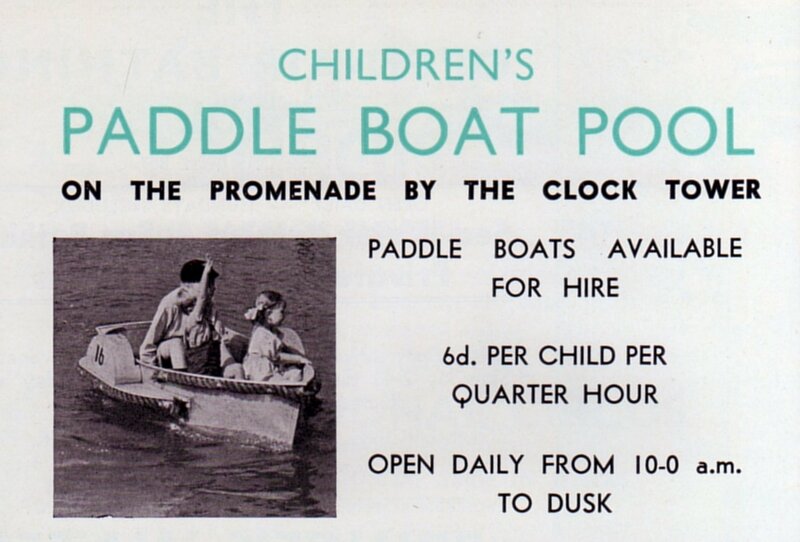 In the afternoon, Maureen and Michael wanted to explore the attractions on the Promenade, so Mr and Mrs Reilly settled down in a comfy deckchair while the youngsters took a trip in a paddle boat on the Pool by the Pier and had a lovely ride around the Children’s Cycle Track. Here tricycles and bicycles are supplied and there is no danger of being run down by a car. Later, they all had fun in the Children’s Paddling Pool on the West Parade, sailing boats and getting themselves thoroughly wet. Another fine day on Monday and a visit to the Beach for a few more sand castles. 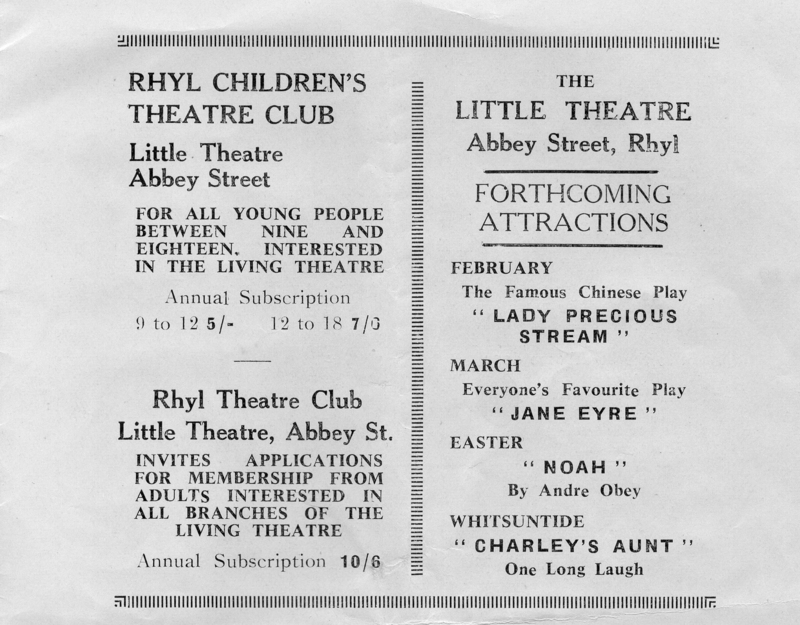 But plans must be made for evening entertainment because the Rhyl Shows are so popular that it is wise to book. While the children enjoy a paddle, Mum and Dad walk along to book seats at the Amphitheatre, then have a stroll along the Pier with its magnificent views of the Beach and the Welsh Mountains behind. Finally, a visit to the Punch and Judy Show, where even Father saw something new and original to laugh about. For a change, in the afternoon, it was decided to take a walk up to the Botanical Gardens along the Grange Road. What beautiful flowers there are and what delightful walks and quiet sheltered gardens. Mr and Mrs Reilly are enjoying a stroll through this vast rose covered archway, while the kiddies work off a bit of surplus energy in the children’s playground alongside. Bowls, Tennis and Putting are all available in the Botanical Gardens. Dad and Michael had a pleasant hour on the Putting Green while the girls visited the Aquarium and Conservatory. After a cup of tea in the Gardens Cafe, from which they could watch the Bowls and the Tennis, back to the Hotel for a wash and brush up and the evening meal. With plenty of time to spare, it was pleasant to stroll down to the Amphitheatre for 7.30pm. 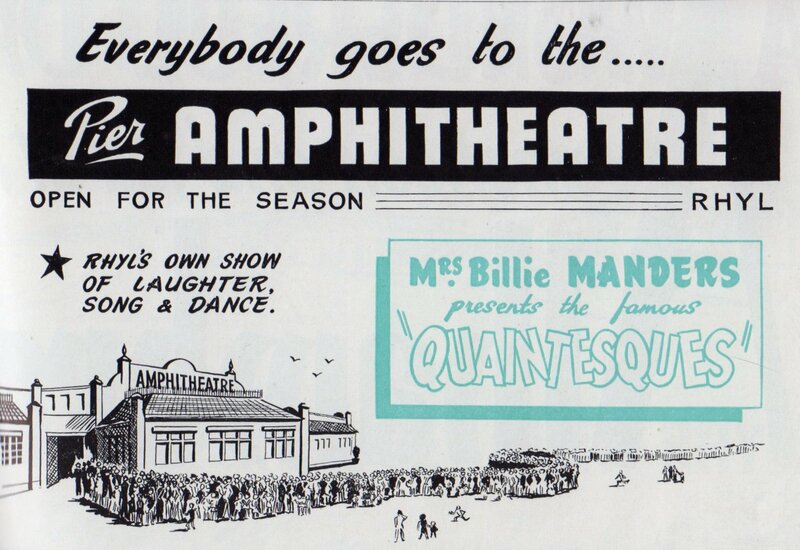 The Quaintesques are a happy party, just the show for a family to see. Plenty of comedy, dancing, singing and music. Maureen, lucky girl, won a teapot at competition time. Tuesday was not quite so promising so the Water Show, at the Bathing Pool, was Father’s idea because, after all, if it’s wet there’s plenty of covered seating, and if it’s fine the children can bathe even while the show is on. 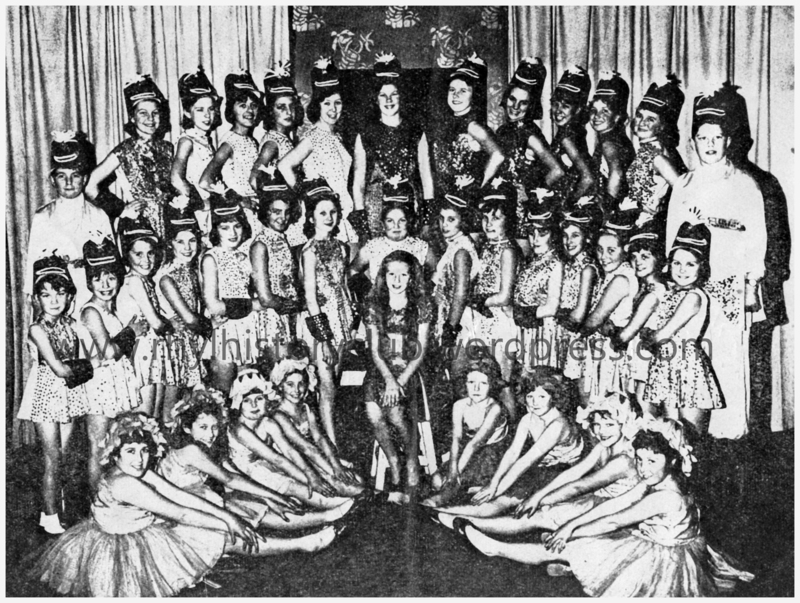 Comedy and acrobatic diving and many dainty swimming numbers by the Phantasettes, make up an excellent morning’s entertainment. After lunch, and do not a minute too soon for the kiddies there was a visit to the Marine Lake Amusement Park. Phew! Some place for thrills! They had a wonderful time. The Rhyl Express is one of the nicest miniature railway trips in the country. It goes the whole way around the vast Marine Lake. 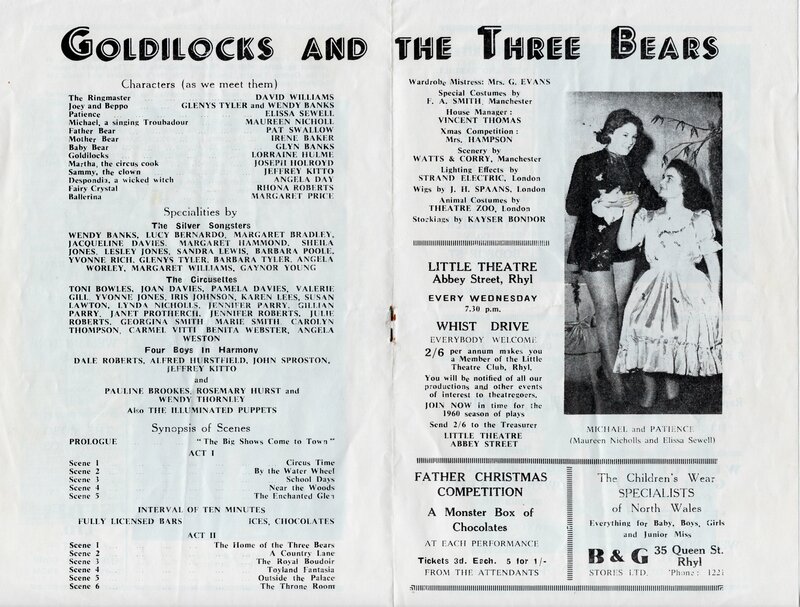 Charlie Chester had heard of the Ideal Family and came out specially to meet Geraldine when they visited the Queen’s Theatre that evening – first house, so that the children could have an early night. They did not go to sleep very early though, they were still laughing at the antics of Charlie Chester and his Show. Wednesday morning’s weather was nice enough to tempt the family to a sea trip and view Rhyl from the sea. It was very enjoyable – the air was so fresh and there was still time to walk to the Garden of Remembrance and afterwards try out those unique, and oh! so comfortable, Continental basket chairs. Warm weather indicated an outdoor evening and so the Pavilion Gardens Skating Rink saw our Family vainly trying to keep their feet amongst other skaters on the Rink during the public skating session. Both Dad and Mum found friends to keep them afloat. It was Mum’s first experience of skating and she enjoyed it thoroughly. Later during the evening there were skating exhibitions, roller hockey and lots of comedy to end a very pleasant evening at about 9pm. On Thursday it was an early start as the whole day was to be spent discovering the beauty spots of Wales. There’s a wonderful stretch of wild mountain scenery within easy reach of Rhyl – Swallow Falls, Llyn Ogwen, Llanberis Pass, Snowdon and A host of other picturesque scenes. Whether you go by rail, car or motor coach no one can afford to miss this beautiful country. 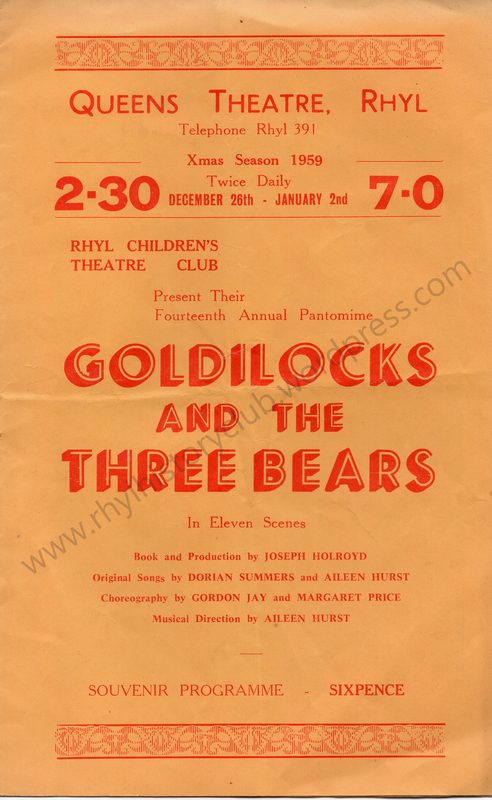 In the evening, after a very full day out, Maureen took the other children to bed whist Father and Mother had a quiet hour in one of Rhyl’s attractive Hotel Lounges and then on to join with the many hundreds od other young folk in dancing to the music of a famous Dance Band. 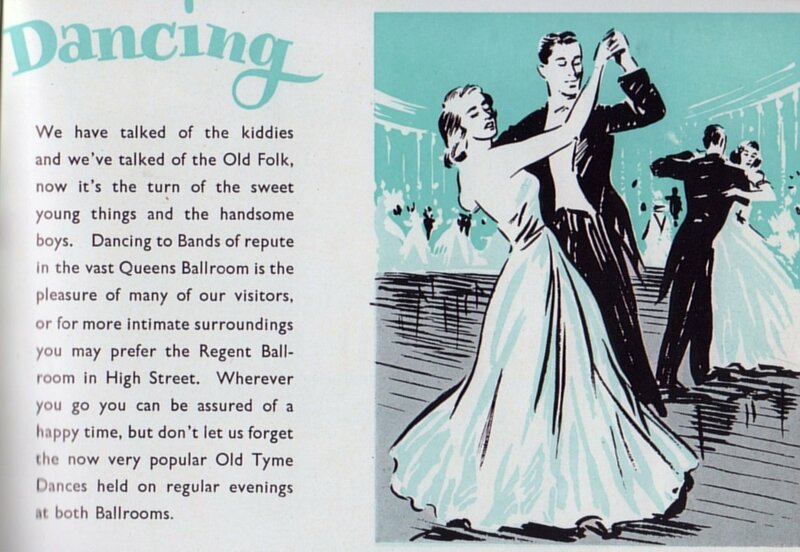 Mum loves dancing, Dad’s not quite so keen, but everyone was so friendly that even he had a go at be-bop before the night was over. Like every other family on holiday Friday was shopping day, of course. Presents must be bought for Grandma and all the other people left at home. In Rhyl’s shopping centres they found plenty to choose from at a reasonable price. In facy it was difficult to decide what not to buy. The Coliseum Fresh Air Theatre was on the programme for the evening. It wasn’t really warm, but the theatre is so sheltered that one could almost have been under cover. Will Parkin always puts on a good show here, and this year’s was no exception. As Friday night was the last night of the Holiday the children, as a special treat, stayed up to see the illuminations. They were thrilled to see all the little incandescent frogs, ducks, butterflies and funny little men amongst the rocks and gardens of the East Parade. They are still talking about the set pieces showing fairy tales and nursery rhymes in coloured lighting. The Pavilion Dome with its ever changing colours so fascinated them that they had to find out how it all worked. Strip lighting along the full length of the promenade completes a magnificent display. Saturday comes and like all things the holiday draws to an end, but after packing there was still time to have a run round to make sure that nothing had been missed. O dash, there’s that nice putting green green on the East Parade where we promised we’d have a game. There’s the Bowling Greens on the Promenade, too. We didn’t walk along the new Promenade to watch play on the Rhyl Golf course. So we close our story of the Ideal Family Holiday, typical of the Holiday that you and your family can spend here. Rhyl F.C. – top of the league! The report in this week’s Rhyl Journal describes how Rhyl Football Club are hoping to roll back the years with a new museum celebrating the team’s illustrious past. RHYL RISE TO THE TOP AGAIN! Amongst the teams below Rhyl in the league were Witton Albion, Tranmere Rovers, Crewe Alexandra, Bangor, Wrexham and Chester. “Before the start of the Rhyl – Witton Albion game at Rhyl on Saturday, Mr Glyn Roberts, a director of the club, in his capacity as chairman of Rhyl F.C. Supporters’ Social Club, handed over a cheque for £200 to Mr Tom Cookson, chairman of Rhyl F.C. The money is yet another contribution from the Social Club, to the football club towards maintaining a first class team in Rhyl. 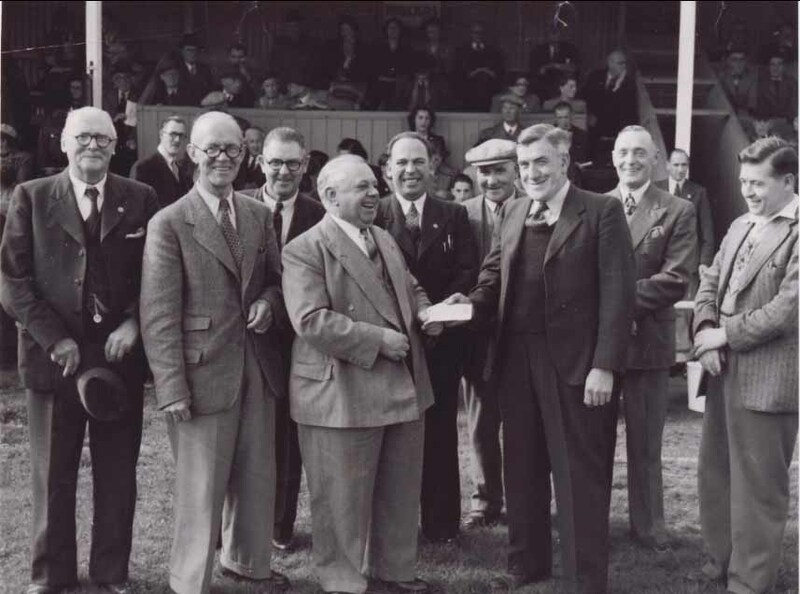 Photograph shows: 3rd from left, Lewis Edwards, 4th from left receiving the cheque is Tommy Cookson from Glyn Roberts. 5th from left and standing next to Mr Cookson is Herbie Evans. Frank Beech is to the right of Mr Roberts. Can anyone name the other men? Another gem from Graham Evans. 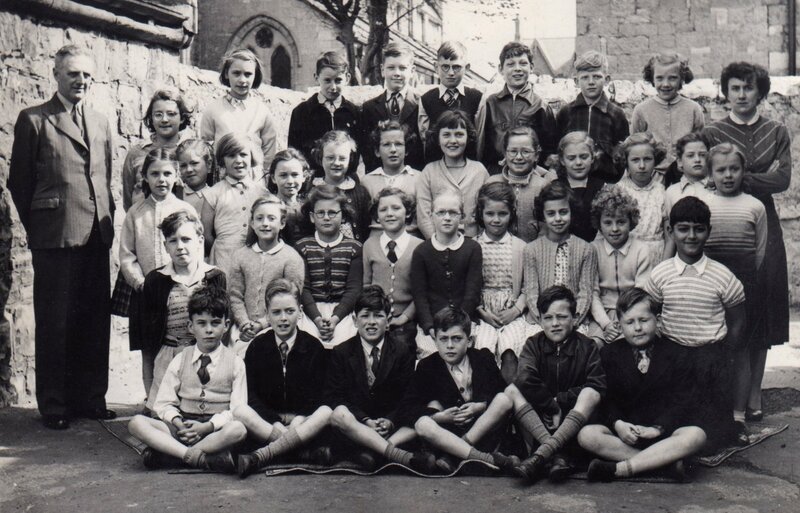 This is a Clwyd Street School class photograph from 1955, possibly of Std. 5. We look forward to more information via your “comments”. Click on the photo to enlarge.